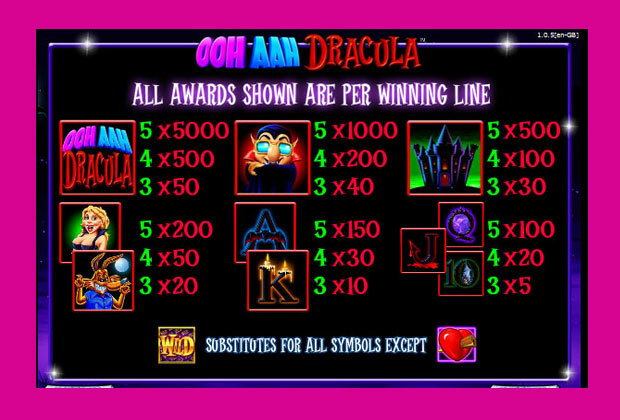 Play Ooh Aah Dracula Barcrest Slots Pokies Game FREE. Ooh Aah Dracula is another hit video slot from Barcrest and the game offers just 10 paylines, making it a great choice for low rollers or those with a limited gambling budget. The game offers a ghoulish theme and an exciting free spin round along with a well paying base game jackpot that awards 5000 coins. With this game, players will enjoy a haunting theme that is depicted through the use of well designed graphics. Though the game does lack a progressive and some other features that may enhance the play, overall this Dracula pokie is one that should not be missed when playing online right below in the free emulator mode. The symbols on the reels appear in 3D and include some great thematic icons that depict the eerie theme. Players will see Dracula, the game logo, the castle, a blonde woman vampire and a werewolf. There are also playing card symbols that are in use. The graphics are appealing and there are some nice animations that are used when winning combinations are created. When playing Ooh Aah Dracula for real money, there are quite a few betting options. The standard bets range from $0.10 to $500 per spin and there is also a high roller betting option. With this, bettors will choose a bet amount that will be used on five spins in a row. The game may not offer a large paying progressive jackpot, but there are some great payouts in the base game as well as the bonus rounds. The base game jackpot is worth 5000 coins. The Wild icon can take the place of most of the game symbols except the heart icons. With wilds in play, players can complete more winning combinations and will enjoy better payouts. The game scatter is the heart and this is how the bonus feature will be triggered. If players get three scatters, they will enjoy 15 free spins on the game. Prior to the free spins, players will see that a base game symbol will be chosen as an extra wild. Getting four scatters will not increase the number of free spins, but will trigger the Stake It or Leave It feature. With this, players can enjoy as many as two rounds of free spins. The first round offers 15 spins with an extra wild and at the end, players can collect winnings or choose to play the second round. With the second round, first round winnings are erased and 10 free spins are played with two wilds. Five scatters offer the same Stake It or Leave It option with three rounds. The third round offers only 5 free spins, but there are three wilds in play. Ooh Aah Dracula is an exciting slot and with the options during the free spin round, players have more control over the amount that can be won. 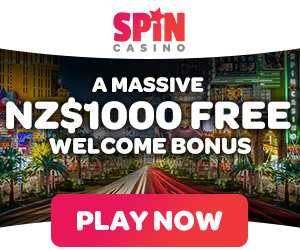 This game is a standard video pokie and there are no second bonus features, but there are some amazing payouts and since the game can be enjoyed by high rollers, it is a hit in many online and land casinos.